Are you a professional looking to add coaching to your repertoire of services? Are you seeking to make a career change? Want to spend your time actually serving your clients instead of completing endless forms and paperwork? Want to work with clients you are actually healthy and are looking for support in accomplishing their goals and dreams? Then coaching might be your answer. Would you like to learn the coaching skills that are so effective with millenials in the workplace? Would you like to be a coach who stands out in the field of coaching? Would you like to learn an established coaching method that will help you in any area—personal life coaching or business/executive coaching? Then the Academy of Choice is for YOU! Coaching is different from therapy and counseling. You already have excellent counseling interventions and know how to work with people. Adding coaching to your skill set can only help you improve and expand your expertise. Even if you already have been coaching, Our revolutionary coaching process can help you take your skill to a new level in helping your clients increase their personal freedom while taking control of their life. Our coaching process is about helping people to stop creating their own misery, while helping them take responsibility for their own happiness and success by putting their time and energy into the things they control, rather than the ones they don't. This means leading people away from blame, anger, and resentment and into introspection, flexibility and proactivity. Our process does away with the victim mentality and seeks to empower clients to reach their goals, while creating the meaningful relationships in their lives that will support and encourage them along the way. Our revolutionary process is not just a coaching technique. It actually becomes a lens through which you learn to view the world and a way you choose to live your life. There is application for every area of your life, e.g. relationships, parenting, self-growth, counseling, teaching, leadership, and goal attainment. The coaches at The Academy of Choice live and breathe the concepts of our revolutionary coaching process—showing, not just telling you, how to move from an ordinary life to an extraordinary one. You will apply the concepts in your own life as you learn to use them with your clients. It will be a transformational experience for you as you learn to live your life using our revolutionary coaching process.. Many people casually talk about change coming from the within but our process shows you step-by-step how to do that so you can live it and then show others the way. I have had my own coaching business since 2004 (see www.therelationshipcenter.biz and www.coachingforexcellence.biz). Prior to that, I had a full-time job and a private practice. I mostly worked with people who were sent to me, rather than those who elected to have counseling. It was a lot of work to help clients understand the benefit of counseling. In my private practice, I only took private pay clients so I didn't have to deal with all the paperwork for insurance companies but I often heard from my colleagues what a drain that is. Coaching provided me with the ability to help voluntary clients without mental health challenges move forward toward accomplishing their goals and dreams. I haven't found anything more rewarding than that! Anyway, I’ve built my business and can significantly shorten the learning curve for you and I have an awesome coaching process I’d love to share with you. I’ve already made the mistakes and can show you how to avoid them. One of the benefits of the Academy of Choice’s program is it not only teaches you coaching skills, but you will also learn the revolutionary techniques of Choice Coaching and have a two-hour overview of business building should you be interested in reaching beyond your local area. You will also receive weekly coaching, upon request, for distance learning students needing an extra level of accountability. You will learn the basics of narrowing your niche, creating a website, search engine optimization, building an email list, creating a product funnel, generating a referral system, creating a newsletter, blogging, social media and article marketing. Our 60-hour program is designed for Master’s-level professionals interested in developing skills in coaching in mind. We have the distance learning program designed for people who like to study at their own pace and are comfortable with technology. We also offer an intensive four-day and then a three-day in-person program three times a year in Chicago. When you are finished with these programs, you will still have seven hours of independent study/exercises that are completed after you leave. For those of you who prefer the distance learning option, we have a program you can complete at your own pace. There are prerecorded videos, narrated PowerPoints, worksheets, assigned reading and a closed Facebook community for interaction with other coaching students. Start today and complete the program when it’s convenient for you. Please note that it is preferred that you take part one before part two, but it is not required. Please choose the date that is most convenient for you. For those of you who prefer the distance learning option, we have a program you can complete at your own pace. There are prerecorded videos, narrated PowerPoints, worksheets, assigned reading and a closed Facebook community for interaction with other coaching students. Start today and complete the program when it's convenient for you. If you register for our in-person program and it is canceled for any reason, you will receive a full refund within five (5) business days unless you choose to apply your payment to a future program. If you are not completely satisfied, simply send me an email, within 30 days of the purchase date, and I’ll refund your money in full. Create and informed consent form. Discuss the differences between counseling, coaching, and consulting. Create a list of essential coaching behaviors. Review the BCC Code of Ethics. List the five basic human needs. Assess need-strengths in practice clients. Practice using Choice Coaching's Powerful Questions techniques. Role play using the our revolutionary coaching process. Distinguish between destructive and healthy relationship habits. Assess when you are working harder than you client. List the elements of an effective plan. Explain organizational roles and culture. Discuss the three conditions of quality. Practice systemic, rather than individual, solutions in management. Teach the coaching process as a mentoring model. Practice win/win solutions in conflict management. Discuss coaching business practices—creating website, newsletter, niche, product funnel, SEO, article marketing, etc. Create your own personalized coaching forms. Develop your budget for your coaching business. Develop a business plan. Complete a thorough self-assessment. Create a plan for improvement with a partner. Still not convinced? Here are the bonuses you will get with the program. When you sign up for the Academy of Choice's coaching program, you will receive our coaching ebook, Powerful Choice Coaching Questions: When You're Ready to Teach Others to Live from the InsideOut. 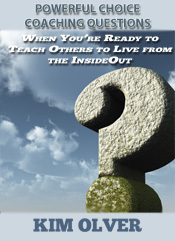 This book will help you internalize the InsideOut Empowerment process by listing the best questions to ask in certain circumstances. Use it as a "cheat" while you are going through the program and it will become internalized. This is a product I sell by itself for $34.97 and you get it free! Another freebie that comes with this program is our Goal Attainment Coaching Package for InsideOut coaches valued at over $75.00. It is a complete combination of left- and right-brained activities to help anyone not just set goals, but accomplish them. It contains, a Goal Attainment Tip Sheet, an eBook, an Action Book, and a podcast. CoachingWebsites specializes in creating websites designed for coaches that are professional, affordable, and effective. All you pay is a monthly hosting fee of $59/month with no long-term contracts. They deliver credit card processing, appointment requests, search engine optimization, and more – it's all included! Attracting new clients and generating more revenue is easy with Coaching-Websites! If you visit this site and provide a promo code of "1FREE", you will receive A Free Website and One Month of Hosting Service with CoachingWebsites. The Academy of Choice does not and shall not discriminate on the basis of race, color, religion (creed), gender, gender expression, age, national origin (ancestry), disability, marital status, sexual orientation, or military status, in any of its activities or operations. We are committed to providing an inclusive and welcoming environment for all members of our staff, clients, volunteers, subcontractors, vendors, and clients.